First I have to admit that I love AirDroid and you did great work to make an app which serves all my needs! Thank you so much for this! I am often using unsecure Wifi networks but I would still like to use AirDroid in a secure way. So I do already use AirDroid via SSL, but due to the missing certificate I can't really be certain that people aren't sniffing my password using a MITM attack. Of course I know that you cannot provide a certificate for everybody. But wouldn't it be easy to enable everybody to upload his own certificate to his phone? By that, everybody who is in need of a certificate and who knows how to install one (or who knows how to access the right folder and put the needed files in there ) could use a real SSL connection. It would be so awesome if you spend some minutes evaluating if this feature would make sense to the majority of AirDroid users and to hear some feedback! Hello there! Am I really the only one who's interested in that kind of security enhancement? I would love to hear the developers opinion on this. I almost forgot my monthly reminder. Did simply nobody have a look into this topic or why aren't here any replies? I'll bump this as well. 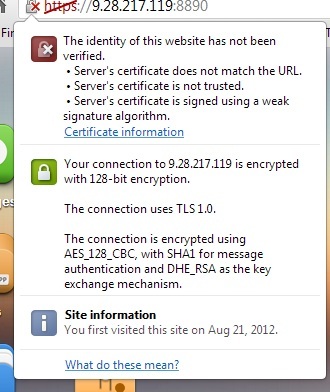 On my network, I have to change the IP address every time I connect (web.airdroid.com doesn't work) AND accept the security certificate. Would really like to skip that second step. Would love to skip both. Sorry about the duplicate. I got an error when I pressed post. Refreshed, same error. Apparently it still posted. I too would like this request to be implemented. It very well could be done if Airdroid could setup some sort of dynamic DNS system (either on a per-phone basis or allow us to use one of our own. That way I could have my own DDNS setup with my phone updating it to it's wifi IP, which will allow me to use any domain and SSL cert I want. So I'd imagine I'd have to put that domain into AirDroid and select the cert to use, and all should be well (if we can use 443). As an interim solution, let me specify the certificate even if it doesn't match the hostname. Yeah, I'll still get errors, but then I'll know for certain that it's encrypted with my trusted private key.